Listhesis is the name for an unnaturally mobile vertebra, which moves, leaves its normal position and, thus, can cause different complaints. 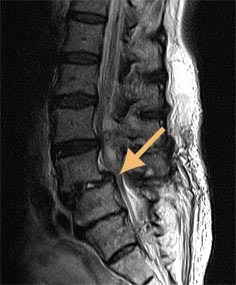 Beside listhesis also the term spondylolisthesis is common. Illustration: The vertebral body in this picture slips backwards and thus presses onto the spinal canal and nerve roots. 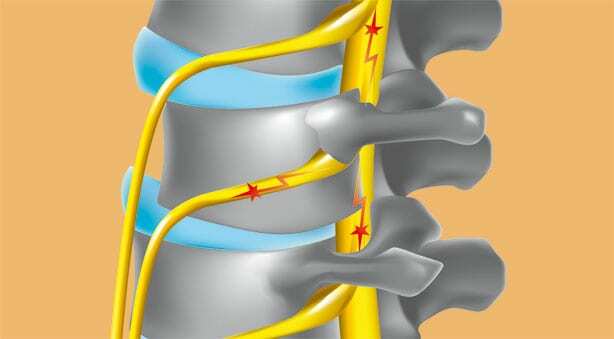 This way it can cause pain, sensation disturbance or paralysis of back and extremities. A forward or sideward movement is also possible. 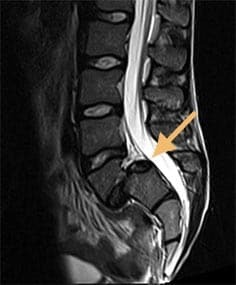 To differentiate listhesis from other spinal diseases causing similar complaints, patients first get a neurological-orthopedic examination including a comprehensive talk about the history and treatment of illness. Often imaging examinations like MRI follow. Magnet resonance imaging enables us to examine and visualize listhesis and other spinal diseases very thoroughly. At Beta Klinik we use an open MRI system which allows us to comfortly examine patients suffering from claustrophobia or patients up to 250 kg (500 lbs). It is possible that listhesis is only visible during movement. For this reason we conduct movement examinations in our open MRI scanner. Patients lay in a prone position and have a pillow under their belly to incline the spine. During another sequence, patients lay on their back with a pillow under it to recline the spine. This way we are able to recognize if a vertebra leaves its position during inclination or reclination. 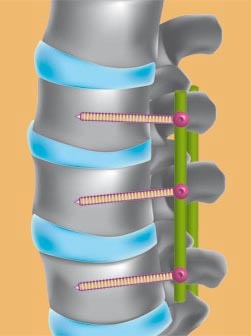 Illustration: If you look at this illustration, you see a stabilization system using screws and rods to permanently stabilize the vertebral body affected by listhesis and the adjoining vertebral bodies. A conservative approach in case of listhesis is microtherapy and medical strengthening therapy. Whereas medical strengthening therapy consists of exercises building up muscles and, thus, relieving the back, microtherapy is a minimally invasive treatment of the complaints caused by listhesis. Under CT navigation, a thin needle is inserted into the osseous nerve root canal. Through this needle we inject swelling reducing and painkilling drugs around the nerve root. Microtherapy has to be repeated two or three times in weekly intervals. Listhesis is also to be treated by microscopic surgery. With Microsurgery and microscopic decompression (microlaminectomy) a skin cut is necessary to create a surgical approach. Besides, the microsurgical removal of spinal stenosis and disc herniations is possibe. Employing a special surgical microscope enables us to work very precisely. Before treating listhesis with stabilization surgery (fusion / stiffening / spondylodesis), the individual usage and chances of success of all other procedures should be taken into consideration. During stabilization neurosurgeons combine bone tissue, plates, so-called cages and screws to permanently stabilize the spine. Learn more about stabilization by clicking here.